On the frozen fields of France, along the 500-mile front of World War I, the guns fell silent on December 24, 1914. 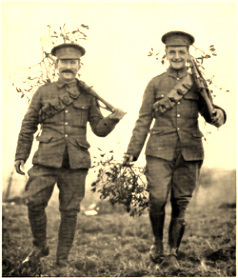 Defying orders and instinct, soldiers on both sides came out of their trenches and ventured into the killing field of No Man's Land to meet their enemies - armed only with curiosity and good wishes. What they found there, and the hours and days they spent in a world without war, echoes still. Celebrate Christmas Eve differently this year by celebrating the rise of peace in the most unlikely of places. A dynamic, non-sectarian event will tell the story of the "Christmas Truce" through narrative, image and song. World-renowned singer-songwriter John McCutcheon will be performing throughout the evening, as well as The Seattle Labor Chorus. A pre-show performance by The Whateverly Brothers & Friends will play songs from and about the WWI truce. A Readers Theater will read letters from actual soldiers writing home from the front describing their experience in 1914. Prayers and hopes for peace will be lifted up by a Christian minister, a Jewish Rabbi, a Muslim Imam and a representative of our local secularist community. The evening will be a celebration of the peace of 1914 and reaffirm for a new generation in our desire for genuine, just and lasting peace. The event is absolutely free of charge. Seating is on a first-come basis. AFTER-EVENT FOLLOW-UP: There was a packed house (even the balcony!) on the 18th for a beautiful program. All the performers and speakers - from the "Whateverly Brothers & Friends" in the pre-show to the Labor Chorus and John McCutcheon, to the prayers for peace - were moving and insightful. The audience was enthusiastic and participated at every turn - from singing along to shouting amen to lighting candles for peace. Most telling of the success is how long so many people stuck around visiting the booths in the foyer or around refreshments in the fellowship hall. This was a wonderful way to spend Christmas, remembering an incredible past, looking forward to a hopeful future.